Take LIE/Northern State West to the Clearview Expressway NORTH, heading toward Throgs Neck Bridge. Get off at 35th Avenue and stay on the service road until you reach 26th Avenue. Make a left over the overpass and another left at the traffic light and you will be heading along the south service road of the Clearview. The field comes up on your right after two blocks. Proceed North on Main Street to Motor Avenue (Motor Avenue is the block before the Rail Road Tracks). Make Left onto Motor Avenue. Make Right into park at traffic light. Take Parkway to Exit 32N Rt 110. Get into Left lane. Make Left at traffic light onto Main Street. Follow above directions from Rt. 110/Main Street. Take Southern State Parkway to Exit 28A South or the Long Island Expressway to Exit 44 South (Seaford-Oyster Bay Expressway - Route 135). Take the Seaford-Oyster Bay Expressway to the end (Merrick Road East). Go 6 traffic lights (approximately 0.8 miles) to Forrest Avenue (Hess Gas Station on corner). Turn right on Forrest Avenue. Travel for 4 Stop Signs then turn right on Jefferson Place. Take Jefferson Place to Admiral Road. Turn left on Admiral Road. The Parking Lot will be on your right. If the lot is full you can park on the street. Go to exit 59, Ocean Ave.and head south. After crossing the LIRR tracks continue south approximately 1/2 mile. The road will curve left and the name will change to Lakeland Ave. Continue on Lakeland Ave., crossing Veterans Memorial Hwy(route 454) and passing under Sunrise Hwy. (route 27). Continue south for approximately 1 mile to a traffic light. This is Tariff Street. Follow Tariff to Cherry Ave. You will see the soccer complex on the left. There are two entrances: through the stop sign and make the first left, or make a left onto Cherry Ave.and then make the first right. Take exit 44 east (route 27). Go to exit 49 ( Lakeland Ave.) and head south. Continue south for approximately 1 mile to a traffic light. This is Tariff Street. Make a right turn. Follow Tariff to Cherry Ave. You will see the soccer complex on the left. There are two entrances: through the stop sign and make the first left, or make a left onto Cherry Ave.and then make the first right. Go to exit 49 ( Lakeland Ave.) and head south. Continue south for approximately 1 mile to a traffic light. Follow Tariff to Cherry Ave. You will see the soccer complex on the left. There are two entrances: through the stop sign and make the first left, or make a left onto Cherry Ave.and then make the first right. Take the Southern State Parkway to Exit 37S (Belmont Avenue). Go four blocks and at the traffic light make a right turn onto Seward Street. Go three stop signs (the street name changes from Seward to Barnum) and make a left onto Monarch Avenue. The soccer field is on the right (you can park anywhere along Monarch Ave). LIE to exit 52. Go south on Commack Road to Crossway Drive (just past the Deer Park Motor Inn). Turn left on Crossway and make the next left onto Headline Road. Take Headline to the end and turn left on Sunburst Drive. Proceed to the park. Get off at Exit 44 for NY-135 S toward Seaford. Take Exit 9 for Broadway toward Bethpage. Make a left onto Broadway and then a left onto Plainview Road. Park will be on the right in less than a mile down Plainview Road. Get off at Exit 28AN to merge onto NY-135 N toward Syosset. Take Exit 9 for Broadway toward Bethpage. Once you get off exit 9, head north on Plainview Rd and field will be on your right in less then a mile. LIE to exit 53. Follow signs to Wicks Road. Go south on Wicks Road for 1/2 mile to campus entrance on right side. Take the Loop Road to parking field 2B. LIE to exit 52 (Commack Rd). Cross over Commack Rd, stay right to Crooked Hill Rd. Make a right on Crooked Hill Rd and take the campus entrance on the left. Take the Loop Rd to the left toward Sally Ann Slacke Center. After the center make a right to parking field 2B. Take LIE exit 53. Follow signs to Wicks Rd. Heading south on Wicks, go to 2nd traffic light and make a right onto Community College Drive. Take the LIE to Exit-62N, Nichols Rd. Follow to Rt.25 (Middle Country Road) and head west toward Centereach. At the traffic light (Island Car Wash) make a left onto Horseblock Road and travel south 1000 feet. The field will be on your left behind the VFW Hall and opposite the Centereach Bowling Alley. Southern State Parkway to exit 22 N (Meadowbrook Parkway). Take exit M3, Stewart Avenue, west. Go to Hilton Avenue and turn right. At the next light, 9th Street, turn left and then left again at the next light, Cherry Valley Avenue. Continue south to First Street and turn right at the light. At the fork, follow the road to the left. The entrance to Community Park will be 100 yards on the right. Go to the far left of the parking lot and enter the field through the gate. Take the LIE, Southern State or Northern State to Route 135 South (Seaford/Oyster Bay Expressway). Take 135 South to Exit 3 (route 105 Massapequa). Make a left at the exit and the first left at the light. Go under the overpass and make the first left (7-11 is on your right). The fields are on your right. Field 11A (South Field) OR 11N (North Field): Southern State Pkwy to Exit 19 SOUTH (Peninsula Blvd/Rockville Centre) - Bear RIGHT onto Peninsula Blvd. Travel approx 1/3 mile and fields are on RIGHT. Turn RIGHT into parking lot. Take LIE exit 63 North Ocean Avenue (CR 83). Make a left onto N. Ocean Avenue heading north. (This road will eventually become Patchogue-Mt. Sinai Road). Continue north crossing 6 intersections until you come to the intersection of Rt. 112. (Hawkins Road is the 6th and 112 is immediately next). Make a left onto Rt. 112. Park is immediately on your right hand side. Southern State Parkway to Exit 30 North (Broadway). Proceed north on Broadway, 1/4 mile to N. Delaware Avenue & turn left. Go past 2 stop signs. Field on right side. Southern State Parkway to Exit 25N- Newbridge Road. Continue North on Newbridge and cross over Hempstead Turnpike (route 24). Make a left on to Salisbury Park Drive West (look for a Firehouse on your right and a Gulf Station on your Left). As soon as you pass the overpass for the Wantagh Parkway, you will see a driveway on your right. Turn Right into the driveway (if you hit the next traffic light, you went too far). The fields are at the bottom of the hill. Take LIE exit 53N or Northern State Pkwy exit 44N (Sunken Meadow/Sagtikos Pkwy). Go to Pulaski Rd West exit. Go 3 lights to Old Bridge Rd and make a left. Take it to the end and make a right on 5th Avenue. 2nd school on the right. Enter lot to the right. Soccer field is in the middle of the track. Exit 32N Rt. 110. Get into left lane and make left at light onto Main st. Go to 2nd light(deli) and make left onto Midwood. Go to end, you will be in front of school. Go to right and follow around. Take Southern State Parkway to Exit 32 (Route 110 South). Take Route 110 South through the Village of Amityville. At the first traffic light after you pass under the railroad tracks turn right onto Oak Street. Traveling West on Oak Street the name will change to Old Sunrise Highway. Take Old Sunrise Highway straight and the fields will be on your right. Take Southern State Parkway to Exit 29 (Hicksville Road South). Take Hicksville Road to Sunrise Highway. Turn left onto Sunrise Highway heading East. Stay to the right. Just before Sunrise Highway goes under the train tracks take the right fork onto Old Sunrise Highway (Route 27A). Continue straight past the light and Field of Dreams is on your left. Jericho Turnpike to Larkfield Road, go North. Go past Burr Rd and Harley Avenue will be on the Left within 1/3 mile. If you get to Cedar Rd, you went too far. LIE to exit 57 make right onto Veterans Highway. Continue straight until you see Lincoln blvd, make a right (if you pass high school you went to far). Middle school is on the right. LIE to exit 56 make left onto Wheeler Road. Continue straight past the high school (if you passed the front of the middle school you went to far as the fields are in the back). Make the first right after the high school to Lincoln blvd. Middle school is on the left. Take Long Island Expressway East to exit 57 (Veterans Memorial Highway). Take service road to second traffic light and make left into Veterans Highway (Route 454). Cross over the west bound service road and go to the 3rd traffic light and make a right into Lincoln Blvd. The school will be on your left. Take Long Island Expressway West to exit 57 (Veterans Memorial Highway). Take service road to first traffic light and make right (Vets Highway). Go to the 3rd traffic light and make a right into Lincoln Blvd. The school will be on your left. Exit 32N. (Rt 110) to 1st. light. Make a left at light onto Main St. Take Main St. 6 traffic lights (go over tracks and rte 109) to Grant (Methodist church on corner). Make a right onto Grant and school is a few blocks up on left. Go to Rt 110 south, go approx 3 miles to Conklin St.(Diner on corner). Make a right onto Conklin heading east. School fields will be approx. 1/2 mile on the left. Make left on to Cherry Street. School field and church on corner. Follow around block to entrance. Take Southern State Parkway to exit 28 N (Wantagh Ave). Take Wantagh Ave north approximately 2 miles and make a right turn on to Straight Lane (before the school building). Go to the end directly in to the school parking lot. Jericho Turnpike to Elwood Road. Go North. At the 4th traffic light turn left into the school complex. High School is on the left, go around to the back and above the Tennis Courts is the Varsity Field. Take Southern State Parkway to Exit 28A South or the Long Island Expressway to Exit 44 South (Seaford-Oyster Bay Expressway - Route 135). Take the Seaford-Oyster Bay Expressway to the end (Merrick Road East). Go East on Merrick Road approximately 2.3 miles. After passing Massapequa High School on the left, John Burns Park will be on the right. Take Southern State Parkway to Exit 32 South (Route 110). Take Route 110 South to the end (Merrick Road - Route 27A). Turn right onto Merrick Road heading West and continue approximately 1.5 miles. John Burns Park will be on the left side across from a small shopping center. Sunrise Hwy ( Rt 27 ) Go Thru Massapequa and after you go under the train tressel by the Sunrise Mall you make the 2nd RIGHT (,that is Louden Ave. ) the field will be past the first light on the right. Or take Southern State Pkwy to exit 32 ( Rt 110 ) SOUTH. Go about 1 1/2 miles and you will cross over Sunrise hwy ( Rt 27 ) after going over Sunrise, go to the 2nd light ( Louden Ave ). Make a right. Field will be up on Left side of road. Sunrise Hwy ( RT.27 ) To RT 110 South. Once on Rt. 110 go to 2nd light and make a RIGHT. That is Louden Ave. Field is up about 1/4 mile on the Left. Or take Southern State to exit 32( Rt 110 ) south go about 1 1/2 miles and you will cross over Sunrise hwy ( Rt 27 ) .after going over Sunrise, go to the 2nd light ( Louden Ave ) Make a right the field will be up on the left. LIE to exit 63, North Ocean Ave. Make a left (going north) onto N. Ocean Ave. At 1st intersection, make a right onto Horseblock Rd. Go about 1 mile, entrance to park is on the left. Northern State Pkwy east to 347 east. Travel on route 347 approximately 5.5 miles and turn left on Moriches Road. The entrance to the park will be on the right. LIE west to exit 62N (Nicolls Rd). Travel on Nicolls Rd approximately 6 miles and turn left on Nesconset Hwy (route 347 west). Make a right on Moriches Road and the entrance to the park is on the right. Exit 42N, Northern State Parkway or Exit 51, Long Island Expressway (Deer Park Road NYS RTE 231). Go north on Deer Park Road. At intersection immediately North of Dix Hills Fire House (north side of Northern State Parkway) bear right on to Deer Park Road East - County Road 66. Follow to Jericho Turnpike - NYS RTE 25 and immediately getting into left turn lane. Make left turn on to Elwood Road - County Road 10.. (Shell Station is on the northwest corner). Proceed north bound on Elwood Road, past Elwood High School and Northport High School, to Fort Salonga Road - NYS RTE 25A. (Storage facility on south east corner). Go north through intersection. Road changes name to Reservoir Avenue. Bear left at intersection with Church Street (end of Reservoir Ave). Proceed north bound on Church Street to intersection with Main Street. (Churches on southwest and southeast corners). Proceed north bound through intersection. Road changes name to Ocean Avenue. Proceed to end of Ocean Avenue at intersection with Eaton's Neck Road. Turn left onto Eaton's Neck Road and go approximately 1/4 mile to entrance drive for Soundview Boat Ramp. Entrance drive will be first right after Eaton's Neck/Ocean intersection. Follow to field parking lot entrance on right. Sunken Meadow/Sagtikos to Exit SM5-West, Fort Salonga Road NYS RTE 25A. (Last Exit before entrance to Sunken Meadow State Park.) Proceed west bound on Fort Salonga Road to Waterside Road. (TD Bank on northwest corner.) Make right onto Waterside Avenue. Proceed north bound to Eaton's Neck Road. There is a Northport Power Plant Sign on northwest corner. Make left and go west bound on Eaton's Neck Road, past the power plant entrance to intersection with Ocean Avenue. Proceed west bound through the intersection to the Soudview Boat Ramp entrance Drive. Bear right onto entrance drive and proceed to field parking entrance on right. Boat Ramp entrance drive is first right after Ocean Avenue, about 1/4 mile west of ocean. Southern State Pkwy to Wantagh Pkwy North. Exit at route 24 (Hempstead Tpk) East. Proceed east and enter the service road on the right hand side. Make a right on to Center Lane (Firestone on the corner). Proceed south on Center Lane (it is the only way you can go). After you pass Wisdom Lane School on your right, there will be a "Village Green" strip of stores. Turn right at the last entrance into the stores' parking lot. The entrance to the fields is straight in front of you at the back of the parking lot. Exit 30N (Broadway). Go to N. Idaho Ave and make a left. Field is 1/2 mile on the right. Exit 6 to Boundary Ave EAST. Go 3 blocks to North Central Dr and turn right. Field is 2 blocks down on the right. Turn right onto N. Idaho Ave & enter complex. Long Island Expressway (route 495) east to exit 63. At the exit, make a left and go back under the highway. Then make another left on to the service road (so you have now turned around and are traveling west on the service road). You will see the field on your right side between exit 62 and 63. For parking, pass the fields and make a right turn at the next light (Waverly Ave) and then a right into the school parking lot. To get to the fields you must walk through the gate. Long Island Expressway (route 495) west to exit 63. Take the exit and continue west on teh service road. You will see the complex on your right side. In order to park, pass the fields and make a right turn at the next light (Waverly Ave) and then a right into the school parking lot. To get to the fields you must walk through the gate. Long Island Expressway, to exit 39 S (Glen Cove Road). Go south to Stewart Avenue and turn right. Go to Hilton Avenue and turn right. At the next light, 9th Street, turn left and then left again at the next light, Cherry Valley Avenue. Turn right at the next light, Stewart Avenue. St. Paul's School will be on the right. 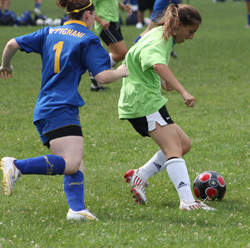 The soccer fields are behind the school. 25 Mill Lane, Farmingdale NY 11735. Take exit 32N Route 110. Make a left onto main street. Go about 1/4 mile to 1st light and make a right onto Mill Road. Then make a right onto Mill lane. School will be on the left. Entrance to the Field is in the back. Sunrise Hwy on eastbound service road between Rt 112 & Hospital Rd. 1 mile on right side after Rt 112 exit. Southern State Parkway to exit 28N Wantagh Ave North to Hempstead Turnpike (RTE 24). Turn left on Hempstead Turnpike. At second light turn into Nassau Mall Parking Lot. Go all the way to the back fence of the parking lot you will see the fields in the school yard. Fence entrance behind Loews Movies. LIE to Seaford-Oyster Bay Expressway South. Exit Hempstead Turnpike (RTE 24) West. Take Hempstead Turnpike West approximately 2 miles pass over Wantagh Ave. (Pizza Hut & Stop & Shop on corner). Second light after Wantagh Ave turn into Nassau Mall Parking Lot. Go all the way to the back fence of the parking lot you will see the fields in the school yard. Fence entrance behind Loews Movies. Northern State Pkwy east to the end to Route 347. Continue east on route 347 pass the Smithaven Mall which will be on our right. Make a left on to Stonybrook Road (Hess gas station on the corner) Go approx. 1 1/2 to 2 miles on Stonybrook Road and make a right in to the entrace of the university. Then make a right in to the 2nd available driveway into the parking field. L.I.E. to Exit 63 north. Go north on CR-83. Cross over Rt 25 and cross over Rt 112, continue to the end of CR-83 to Rt 25A. Make a left onto 25A and the first left to the soccer field (Heritage Park). Southern State Pkwy to Exit 19 SOUTH (Peninsula Blvd/Rockville Centre) - Bear RIGHT onto Peninsula Blvd. Travel approx 2.5 miles until Ocean Ave - Make LEFT turn on Ocean Ave - Go past LIRR overpass and make LEFT on Sunrise Hgwy. Get into right lane immediately and travel approx 1/3 mile under the overpass. Make first RIGHT on Windsor Ave. Turn RIGHT into parking lot. Sunrise Highway Exit 37 109 East Babylon, Take to Arnold Ave (Pro Lube corner) at next light make right. Go three stop sign to Albin Ave make right. Park driveway is on your left. Southern State Exit 33 109 East Babylon, Take 109 to Arnold Ave (Pro Lube is on corner). Once you come over Sunrise Hwy Arnold Ave will be next light make right. Go three stop sign to Albin Ave make right. Park driveway is on your left. Southern State to exit 33 109 East. Take 109 to Old Farmingdale Rd. Once you pass over Sunrise Hwy stay in the left lane. Pass the next light there will be a Stop in Shop, Pro Lube and two gas stations at that light once you pass that light the next left you can make do so . This will bring you to Old Farmingdale Rd. You have to cross over 109 to get to Old Farmingdale Rd. Take Old Farmingdale Rd. to first driveway of school on your right. The field will be on the right of the parking lot. Sunrise Hwy to exit 38 Little East Neck Rd. Once you get off the exit stay on the service road make a right at the posted sign Little East Neck Rd. Make a right at Rowland Place and then a left onto Little East Neck Rd. At the next light make a right onto Old Farmingdale Rd. The school will be on your left. Go to the last driveway make left and field will be right of the parking lot. Southern State to exit 37S Belmont Ave. Take Belmont Ave to Old Farmingdale Rd. Once you pass over Sunrise Hwy on Belmont Ave the next light will be Old Farningdale Rd. make a right onto Old Farmingdale Rd. School will be on your left. Make a left into last driveway. The field will be to the right of the parking lot. Sunrise Hwy to exit 38 Little East Neck Rd. Once you get off the exit move to the right lane and make a right at the posted sign Little East Neck Rd. Belmont Ave. Make a left onto Arthur Ave then a left onto Little East Neck Rd. At the next light make a right onto Old Farmingdale Rd. the school will be on your left. Make a left into the last driveway field will be to the right of the parking lot. Southern State Pkwy to Wantagh Pkwy North. Exit at route 24 (Hempstead Tpk) East. Proceed east and enter the service road on the right hand side. Make a right on to Center Lane (Firestone on the corner). Proceed south on Center Lane (it is the only way you can go). Wisdom Lane School will be on your right. LIE to Exit 62 North (Nicolls Road) to Rte 16 East (Portion/Horseblock Rd).Go in to the town of Farmingville. Look for KK Athletics on the left. (If you pass North Ocean Ave you have gone too far). LIE to Exit 63 North (North Ocean Ave. Make a left on Horseblock Road (Rte 16 - just after Teachers Federal Credit Union and Taco Bell on right and Kmart shopping center on left). Take Horseblock Road west in to the town of Farmingville. Look for KK Athletics on the right. 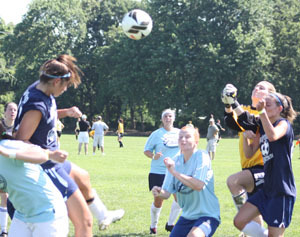 League Office 631-512-8335 | © liwomensoccer.com 2006 - 2019 All rights reserved.